November | 2012 | Vikings, Books, etc. 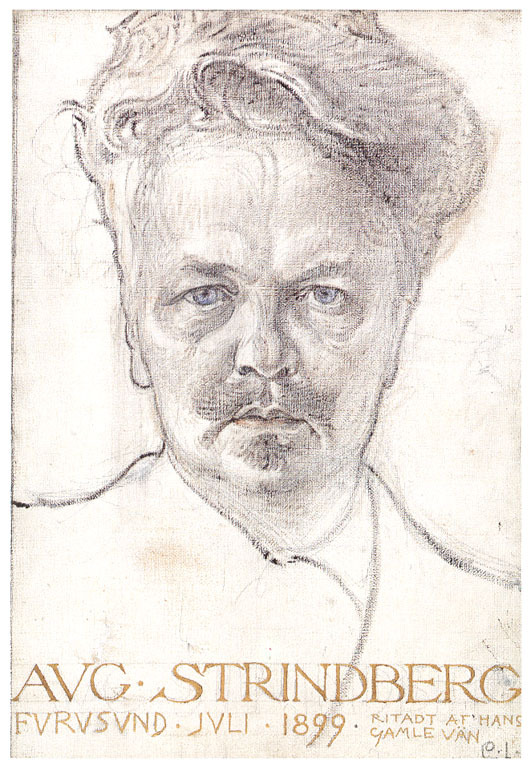 A portrait of Strindberg by the famous Swedish artist Carl Larsson. As I mentioned in a previous post, 2012 is Strindbergsåret, the Year of Strindberg and the centenary of his death, and Scandinavian Studies departments and programs throughout the world are of course hosting lectures, performances, and other events celebrating, analyzing, dissecting, deconstructing, etc, this most canonical of Swedish authors. Among these is a conference about Strindberg’s construction of Swedish history, underway now at the University of Tartu. Here at Gustavus we have a lecture tonight (11/15) by author and producer Lena Einhorn called “August Strindberg and his turbulent life”and on the 29th of this month the Theatre and Dance department will present “The Strindberg Project” (not to be confused with this Strindberg Project by the Cullberg Ballet), various vignettes from Strindberg’s plays performed throughout the Folke Bernedotte Memorial library. Strindberg is fascinating as both an author/playwright and as a character, and he exploited himself as the latter often enough. Apart from his self-representation, I think a large part of what I find fascinating about him is the breadth of his interests–well, OK, it’s a bit weird how he was an alchemist, but hey, it makes him interesting, and as someone who enjoys writing both fiction and poetry, working as an academic, and painting, I find it encouraging that Strindberg had some degree of accomplishment as not only a writer, but as a historian (which is what the Tartu conference is about) and as a painter. As Kjerstin mentions in her blog post on Strindberg at Gustavus, we have one of Strindberg’s paintings here at Gustavus in the Hillström museum, on loan from the National Museum in Stockholm along with a wide range of other pieces (including one Carl Larsson!). The picture (Solnedgång, = Sunset) is below. Click on it for a link to the picture on the Hillström museum webpage.